When it burns, it enchants one and all with its aroma that stimulates mind, body, and soul. 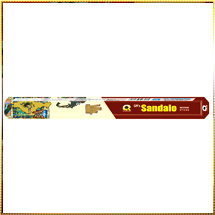 Consistent burning, rich and rare fragrance, and less smoke add to the specialties of our Sandalo Incense Sticks. We have used premium combustible materials and aromatic flowers to prepare Sandalo Incense Sticks keeping the purity level kept in Indian religious customs. This Incense Stick carries the legacy of fragrance of pure Sandalwood, and exotic and rare flowers. Also, the combustible materials are eco-friendly that releases less smoke. Artistically wrapped in fancy packaging that ensure precise sealing of the scent also compels the buyers to buy our products.